A Gorgeous Chrysler Museum Wedding in the heart of Norfolk, Virginia. We are so happy to share this Chrysler Museum Wedding! This year is full of new venues for us and we couldn’t be more excited! Jacob & Brielle’s wedding at the Chrysler museum in Norfolk Virginia was absolutely gorgeous and we couldn’t get enough of this beautiful venue. We have another wedding coming up with Tyler & Ashley there in September and after shooting at this gorgeous site, September cannot come fast enough so we can visit again! This wedding was extra sweet for me. You see, I have been taking their pictures for quite awhile. If you think they are babies here… You should see them here! Also, being so young they reminded me of Luke and I when we got married almost 15 years ago! I myself was 19 and even though I was young when you know you know. Jacob and Brielle have known for a long time and it was such a joy celebrating these two! Brielle’s style is classy and elegant. Their wedding showed just this. With hints of blue hydrangeas and pink garden roses, this museum wedding was gorgeous. I loved how the design only highlighted the venue and yet still let the venue shine. She did such an incredible job planning her wedding and it really showed her thought to detail and style on the big day. Luke and I decided on doing the First Look at Pagoda Gardens. There was this sweet older couple in the background that wanted to watch it all unfold. They were in the pictures so I had to politely ask them to stand off to the side… Little did I know they were the owners of the garden… Ooops! They were super sweet though and the gardens were a perfect location for Jacob and Brielle’s intimate first. When Jacob turned around and saw his bride, he was speechless! He put his hands to his face and tears just began to fall. It was a beautiful moment and those pictures I know they will cherish always. We partied the night away at the Chrysler Museum with the newlyweds. As we mingled with the guests, I didn’t realize how many of our past couples were at the wedding! It didn’t dawn until me until the end of the night that we should have gotten photos with them all! Kicking myself now but definitely next time! It was such a great reminder that we are so blessed to be able to call this a job. We have made incredible friends through this journey and the lives we have been able to be a part of is truly a gift. Jacob and Brielle, Thank you for inviting us along for the ride. Luke and I know that this is only the beginning of your love story! We are so excited for the adventure that awaits! You both know that we absolutely adore you two and we look forward to the next chapter in your lives! Wishing you a lifetime of love and happiness! Thank you to this incredible team who worked their butts off to make this a remarkable day! 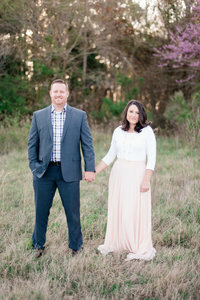 You can see the newlywed’s engagement session here.